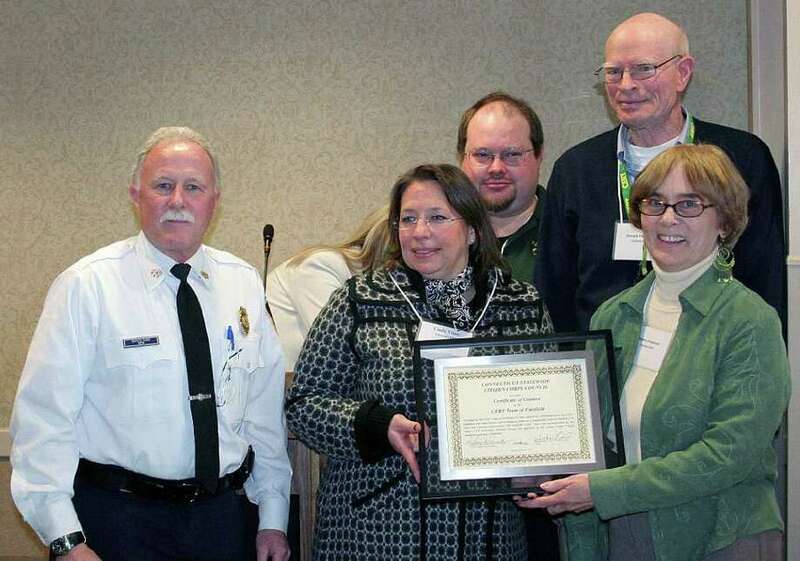 Fairfield's Community Emergency Response Team was honored recently by the Connecticut Citizen Corps Council with its CERT Unit Citation Award. Fairfield CERT President Cindy O'Neill-Vitale accepted a Merit Award for exemplary community service to the CERT mission statement and for following CERT guidelines. "The Awards Committee applauds the outstanding contribution the CERT Team made during Tropical Storm Irene and Winter Storm Alfred," council Chairwoman Katherine McCormack said in a letter to First Selectman Michael Tetreau. "The contribution the CERT volunteers made to the town of Fairfield and to neighboring communities exceeded the criteria that are connected to this prestigious award." CERT is an organization of more than 60 Fairfield volunteers who assist the town in the event of an emergency or disaster and the program and its training began in 2007. Members go through a basic training program established by FEMA and the Department of Homeland Security, which includes disaster preparedness, fire safety, disaster medical operations, search and rescue, command structure, disaster psychology and terrorism and CERT. They assist first responders under the direction of local emergency management. Tetreau, who nominated Fairfield's CERT, said, "Our town is fortunate to have such a dedicated group of volunteers who are a vital asset in asisting our emergency responders with community safety and disaster preparedness and relief."